They run together quite nicely if you can see through the noise. You’ll notice, for instance, that your league average (.500) is more often than not the low-water mark, with the notable exception of the 1980s. 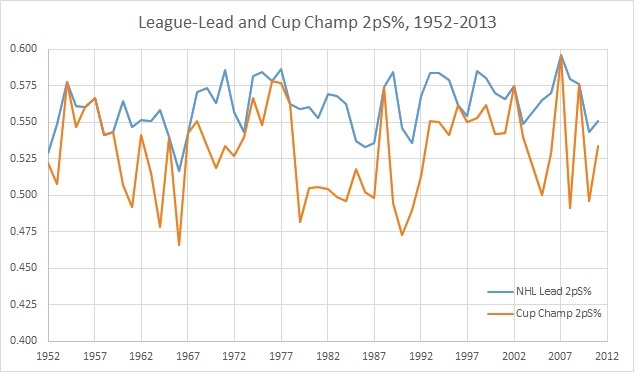 Overall, in 60 years the leader in 2pS% won the Stanley Cup 15 times, and lost in the Finals 11 times. Only once did the leader fail to make the playoffs, in the case of the 1961-62 Detroit Red Wings. Personally, I’d say making the playoffs should be the primary barometer of success; it typically involves sustainable and/or sustained success, whereas the playoffs themselves can be a bit of a crapshoot by the Cup Finals. Note: Ignore the “10GP” there; supposed to read “10 Year”. 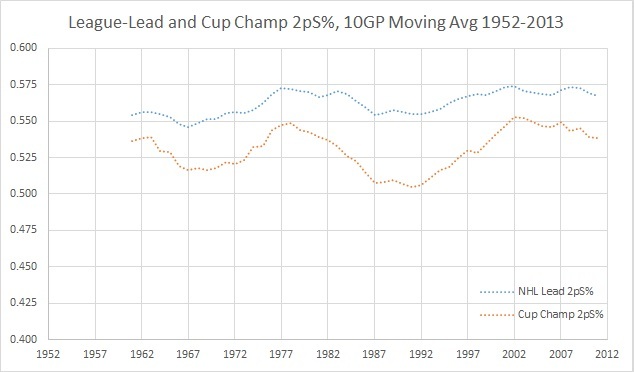 As you can see, the movement between 2pS% leaders and Cup winners strikes a steady balance, only interrupted by the 1980s. To be clear, the 1980s were a messed-up decade (it’s primarily responsible for our current jean jacket population), but NHL-wise it fit into a very prolific scoring stretch for the league, one that actually (for large part) came to a close after the 1992-93 season. During this stretch, three dynastic teams amassed a peculiar amount of primarily offensive talent in the New York Islanders, Edmonton Oilers, and Pittsburgh Penguins. This era probably needs even more investigation, but I’d argue these teams were able to lean on their talent to out-offense their opponents, which can be easier when you boast virtually unprecedented skill (Bossy, Gretzky, Lemieux) with a Hall of Fame “supporting cast” (Trottier, Potvin, Gillies, Kurri, Coffey, Messier, Francis, Jagr, Coffey again…Phil Bourque). 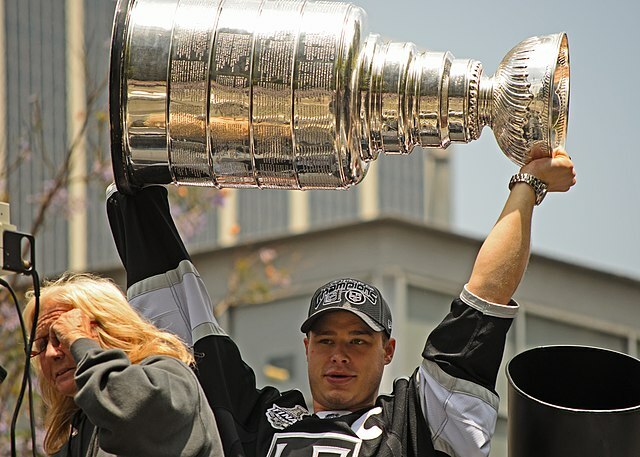 Lost in the Cup exaltation are some remarkable possession dynasties, including the 1970s New York Rangers and Buffalo Sabres, 1980s Philadelphia Flyers, 1990s Boston Bruins and St. Louis Blues, and the 2000s Ottawa Senators and San Jose Sharks. Though none of them won the big one, they all were making the playoffs and, in some cases, making it all the way to the Cup Finals. Whatever the case, add this to the growing stack of evidence for the importance of possession. ← Should the Winnipeg Jets Hold On to Paul Maurice? The importance of possession is widely accepted. This tells me that it’s not the only way to skin a cat although it may be the most reliable. If only we could see through the noise of shooting percentages. I suppose we know who the high percentage guys are at least at the extreme but its hard to judge smaller differences between players in this aspect. It seems easier to judge smaller differences in possession ability.